The event to celebrate the World Brain Tumour Day took place on 15 June 2016 at the West German Cancer Centre (WTZ) in Essen, Germany. 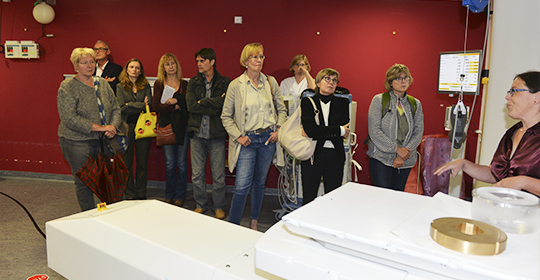 On 15 June 2016, the West German Proton Therapy Centre in Essen (WPE) conducted a training course on “Modern Therapy for Brain Tumours on Adults – New Chances and Opportunities”. Prof. Dr. med. Beate Timmermann, Director of the Clinic for Particle Therapy, hosted the program. Among other related topics, selected experts from neurosurgery, internal oncology, radiation therapy and translational research presented the current state as well as new perspectives of the interdisciplinary concepts for the treatment of brain tumours. More than 80 interested participants from various participating professional groups and representatives of self-help groups and patients were able to inform themselves about the various possibilities of modern radiation therapy and the opportunities of high-precision proton therapy at the WPE. In conclusion, the evening opened an important insight into the potential of interdisciplinary collaboration and innovative research for the benefit of patients with brain tumours at the Essen University Hospital and the WPE.